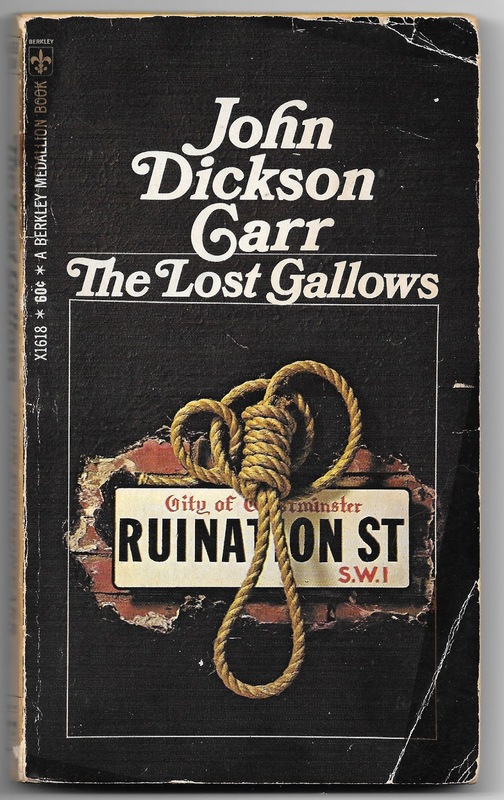 TYWKIWDBI ("Tai-Wiki-Widbee"): "The Lost Gallows" and "Castle Skull"
These two books are the second and third John Dickson Carr novels featuring Henri Bencolin. Written in 1931, they are also among his earliest writings. 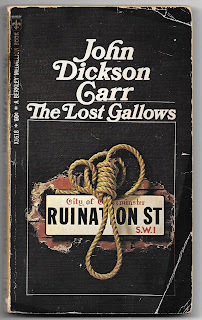 With that timeline in mind, I shouldn't have been surprised to find The Lost Gallows a bit sub-par compared to Carr's later works. There is no locked room; several items appearing "mysteriously" in a closed room may foreshadow his later works, but the presence of a secret passage in the walls is an explanation he would not stoop to in his premier novels. The plot is convoluted, and while arguably "fair" is ultimately unsatisfying. There were numerous awkward turns of phrase, such as "I leaned against one of the curio cabinets, and the tides of death and silence bore me into murky realms," and "An enormous roaring silence was in the room." This is the kind of mystery that one reads for completeness when consuming the corpus of an author's works, but not one that I would recommend to a new reader of JDC. "True and spontaneous emotion is always incoherent. A man really in love can only gurgle foolishly to his lady; it is your unmoved Don Juan who writes her the fine, elaborate, theatrical love-verses." "... at the card tables, under gimcrack canopies of lights, they could toss away their wives' fortunes with the utmost nonchalance." An uncommon word, used sparingly nowadays to describe something "showy but unsubstantial," "a useless ornament." Used thus by Isaak Walton in his Compleat Angler: "Ribbins and Looking-glasses, and Nutcrackers and Fiddles, and Hobby-horses, and many other gim-cracks and all the other finnimbruns that make a compleat Country Fair." "Sir John stood very straight and rigid. Color was in his cheek, and his cold eye said, "Swank!" What he replied was: "Please be serious." "Swank" used here not in the sense of "fashionably elegant," but rather the more deprecatory sense of "swagger, show off."" "Inside, spread on a red bandana handkerchief, lay a long-barrelled revolver with an ivory handle, some large glass buttons, a couple of gilded tassels, and a trumpery watch." ("worthless finery, bric-a-brac, junk). Interestingly, from the French tromperie = "deception" (and thus "tromp-l'oiel"). 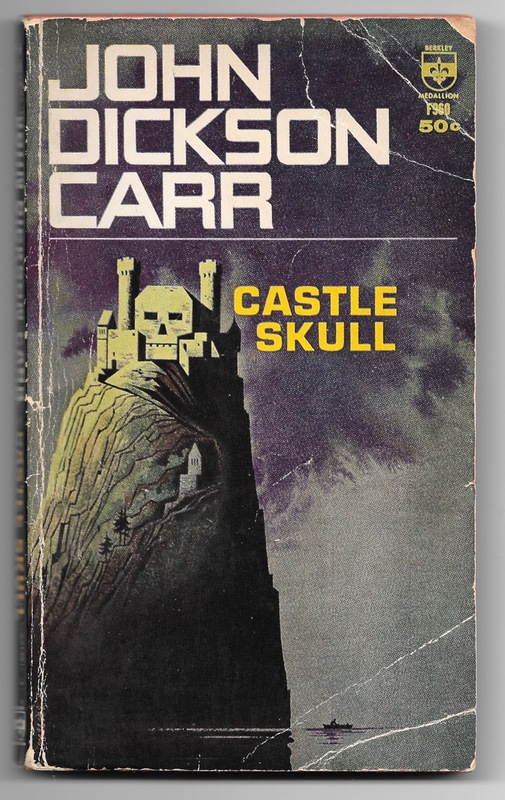 Castle Skull has the better story of the two. This is also not a "locked room" mystery - it's more of a conventional "whodunit." The murder takes place in a German castle situated across the Rhine from the detective and the likely suspects. There is a bit of a deux ex machina solution, but it's not unfair. The most satisfying aspect for me was that as the plot was resolved in the final chapters, I had my mental list of the most likely murderer, and the true malefactor was not even on my list of suspects. "A kerosene lamp stood on a deal table... Von Arnheim lifted the shade and kindled the wick." A word I associate more with fireplaces and bonfires rather than lamps (and in the book also used in reference to lighting a match). Perfectly valid usage of course; also can be used to describe giving birth or as the collective noun for a group of kittens. From the Old Norse kynda "to inflame." "Our lights gave us only a glimpse of the Savonnerie carpets, of the silver fire-screen, and of those haut-lisse Gobelins which were woven, one yard a year, to glorify Louis Quatorze." The Metropolitan Museum webpage on tapestries says that a more likely rate was one (square) yard per month. "This room, the hall... everything is swept and garnished. Look!... Not even any dust..." I don't understand this usage of the word. "The homely, attractive face, with hair a little tousled..." Odd juxtaposition; usually means "unattractive." Perhaps used here to mean "plain." "Cressets flamed along the battlements..." A metal cup suspended from a pole, filled with burning pitch, used for portable illumination. "Bencolin stood with von Arnheim near the tabouret of the cocktail-shaker..." Per Wikipedia: "The popular sense refers to a small portable stand or cabinet, with drawers and shelves for storage. It is used as a method to bring organization to a work area. This name for a portable cabinet is common to artists. However, in the context of the Arts and Crafts Movement, a taboret is a stand for a plant or a beverage." On my 0-4+ scale, I'd rate both of these novels 2+. Decent mysteries, but not a tour-de-force like the ones he crafted in his later years. 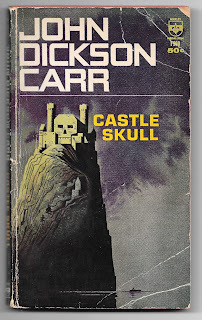 I love John Dickson Carr's books (also writing as Carter Dickson). Sir Henry Merrivale was my favorite character. I think homely can also mean familiar.